Minimum System Requirements: Windows 98/ME/XP, 450 MHZ Pentium ,128 MB RAM, and Flash Player 7. MAC: 500 MHZ PowerPC G3 or later, 128 MB RAM, and Flash Player 7. 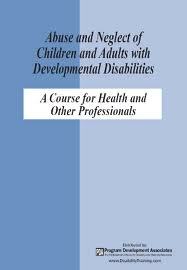 This comprehensive CD-ROM consists of 13 self-paced instructional modules which address the complex issues related to abuse and neglect of children and adults with developmental disabilities. The course is appropriate for professionals serving people with developmental disabilities in a wide variety of settings, including health, mental health, rehabilitation, education, protective services, the courts, and law enforcement. Developed by The Partnership for People With Disabilities, this course content includes: Scope and significance of the problem, an overview of developmental disabilities, communication, risk factors, dynamics of abuse, family and cultural issues, special considerations in the use of medications, recognizing physical and emotional abuse and neglect, recognizing sexual abuse, assessment and documentation, reporting abuse and neglect, follow-up and treatment, prevention strategies, and resources. The interactive graphic design includes video interviews with children and adults with developmental disabilities, their caregivers, and disability specialists. Each module includes extensive resources and links to relevant websites. Several formats are provided on the CD-ROM, including a complete audio version.